Trainers are aircraft employed to train new pilots and aircrew. They required controls for both the student pilot and the instructor so that the instructor could take over if the student made any dangerous mistake. Basic trainers also had to have easy handling and excellent visibility. 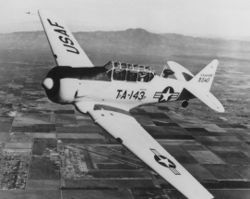 Advanced trainers had characteristics more closely resembling those of actual combat aircraft, which were characterized by higher wing loading and were not necessarily easy to handle. Once a student pilot was proficient in flying a powerful modern aircraft, his training could be completed in ordinary combat aircraft, preferably the same models he would be flying with his operational unit.